Are you lover of Windows 8 Metro style? Now you can bring it to your Chrome new tab using iStart Chrome app. 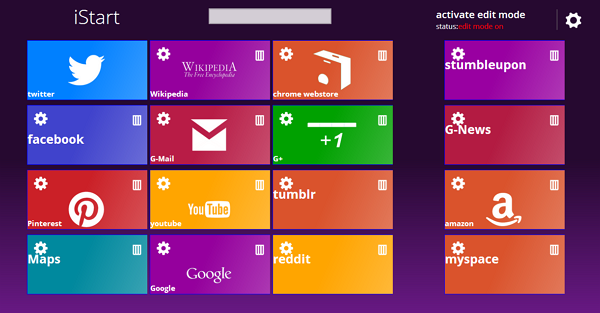 This app replaces your default Chrome tab into awesome new metro UI like a start page in Windows 8 operating system. It allows you to easily personalize your new tab screen as your wish like edit the tiles, changing app colors, add your own background images and more. The app shows some most popular websites on your screen like Facebook, Wikipedia and more. And it has fast access bar, lets you launch the app by simply typing some letters of the apps name. And the main thing is the works without internet connection.